Now that we know how to introduce new records, we will learn how to modify them. These are maintenance tasks on our Table. We need to open our table in case we have closed it. 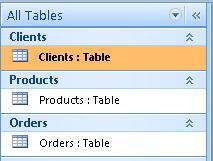 We can click on the cells to move around the Table or we can use the cursor keys. We can click on F2 to enter the Editing mode after we have place the cursor on the cell we want to edit. We can also click on the cell. To know we are in editing mode, the data will appear marked in black, as you see in the image below. If not, we are only in the scroll mode. If we see the cursor, we can begin editing. One of the modes allows us to edit while the other allows us to move within our table. In the Scroll/move mode, we can use the cursor key or other key such as the "Home' or "end" keys. Be careful when using the "Delete" or "Supr" key. If we are in editing mode, it will delete one character, if we are in the Moving mode, it will delete the entire content. However, we shouldn't worry because Access has the "Undo" command. This allows us to undo any mistakes. Be careful, though. Sometimes, there are things we delete which can't be undone, such as deleting an entire Record. There are some fields we won't be able to modify. These are the Autonumber fields since Access works on them automatically. Also, some calculating fields in some Queries and forms. We will see these types of fields in later lessons.